Traditionally, branding has been a one-way communication stream. Successful brands -- from Coca-Cola to Coco Chanel -- have spent huge sums of money creating ad campaigns of polar bears or models in exotic locales. The aim of these campaigns was to dictate to audiences what was cool. And not so long ago (think Mad Men era) there were far fewer channels of communication. Everyone sat around reading one of a few newspapers or watching a handful of television stations. As a result, these expensive campaigns placed in one of these channels had guaranteed exposure. Today that kind of guarantee doesn't exist. The rise of the internet, and more importantly the ubiquity of the smartphone, has shattered this traditional system. The advertising playbook has expanded from television, radio and print to also include banner ads, mobile ads, Facebook and streaming content, just to name just a few. If it were just an expansion in the menu of options, traditional brand builders would be fine, as it would be just a matter of tailoring the same message to all these different formats. But that isn't the case. The impact of the smartphone has turned the consumer of brand building into their own brands: through every Instagram image she captures, message she sends through Twitter or post she pins on Pinterest, each individual creates a story, a brand about themselves to share with the outside world. What does this have to do with traditional brands? Everything. The Boston Consulting Group recently published a study: “How Millennials are Changing Marketing Forever.” The report detailed what they coined “the reciprocity principle” as they wrote, “Millennials expect a two-way, mutual relationship with companies and their brands.” As individuals become brands in-and-of themselves, the tables have turned, so the smartphone generation expects these brands that they consume to not just communicate at them but also with them. Here’s the best news for entrepreneurs: The two-way communication is far less expensive than traditional branding. The channels of Facebook, Twitter, Instagram, Pinterest and Tumblr, are all entirely free to use, and it is on these channels that this two-way communication occurs. The reciprocity principle requires not cash but authentic communication. Having a conversation with your community is free and when done right (that is to say done authentically), it converts mere customers into true brand ambassadors. And these brand ambassadors are powerful multipliers of your brand. Our company Zady, which is working to transform the current environmentally ruinous apparel industry by creating a brand built on the principles of beauty and sustainability, infuses the reciprocity principle in everything that we do. 1. Ask and you shall receive. We noticed that a customer posted a photo on Instagram of their latest Zady package with their dog, and requested that Zady carry sustainable products for their pets. We didn’t let this comment go unheard. But we wanted to test the waters, so we re-grammed the picture on our Instagram feed and posted it to Twitter, asking our audience what other products they were interested in seeing us carry. Your company can do the same simply by asking, preferably with some visuals, what people want to see either on your site or with your product. 2. Open your ears. 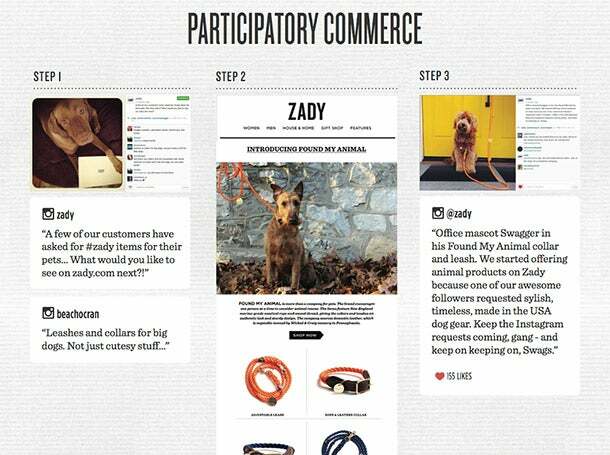 The re-gram garnered an overwhelming response that folks wanted sustainable dog products. Everyone wants to have his opinion heard, and you will get responses to the question, but just make sure that each person feels heard. You can do this simply by liking their comments or reposting their comments on your company’s social accounts. 3. React. We followed up to this query by searching for a stylish, long-lasting, locally and sustainably produced dog product. By the time we had the product up on our site and sent an email out alerting our customers of its arrival, our audience was so engaged that our first run of the pieces sold out within days. Of course, the key to the two-way conversation is the response. You have to make your company flexible to following what your community tells you. We see examples like this as not just good for sales in the short run, but more importantly they help build a sustained, long-term relationship with the customer. This helps convert customers into crusaders for your brand: All of that without spending a penny.